Dogs can develop bald patches suddenly or over a period of time, depending upon the cause of the hair loss. Called alopecia, the condition is characterized by a lack of hair where it would normally occur, sometimes accompanied by crusty, inflamed skin. If you notice hair missing from your dog's coat, contact your veterinarian, who will determine a cause and prescribe an appropriate treatment regimen. Hair loss may occur in dogs of any age or breed. Trauma to the dog's skin, such as a burn or bite, may affect hair growth in that area. Dogs who have been poisoned with substances such as mercury or iodine may lose portions of their coat. Dogs recovering from illness or pregnancy also may suffer hair loss, as well as those with protein deficiency in their diet. Hormonal disorders, such as hypothyroidism, can cause a dog's hair to fall out, according to the Merck Manual Pet Health Edition. The dog may scratch his hair out if he is afflicted with external parasites, such as fleas or mange, or fungal infections such as ringworm. When a dog's skin is irritated or inflamed from parasites or bacterial infections, he may scratch incessantly, removing hair from the affected areas. Mange, caused by the demodex mite, causes localized or widespread hair loss and inflammation of the hair follicle. 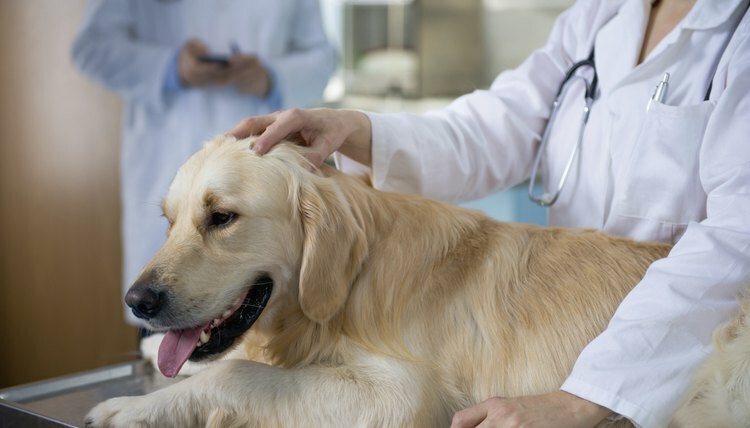 Ringworm, a highly contagious fungal infection, causes pruritus or itching in dogs as well as hair loss that manifests as raised, rounded lesions or hair loss in circular patches, according to PetMD. Flea infestations may cause alopecia, particularly if the affected dog is allergic to the saliva of the fleas. A single flea bite can cause the dog to scratch himself constantly, leading to hair breakage and loss. Dogs who lick and chew their skin due to stress, allergies, insect bites or mites may develop hot spots, or moist eczema, on their head, hip or chest areas. Hot spots can be painful and require thorough cleansing and antibiotics to prevent spreading and infection. The area around the hot spot frequently is shaved to promote air circulation near the wound. Good grooming habits, a regular flea-control regimen and plentiful exercise will prevent most hot spots, which occur most frequently on long-haired breeds, according to the American Society for the Prevention of Cruelty to Animals. If the dog is chewing on himself due to anxiety, the addition of Saint John's Wort to his diet may ease his symptoms. Dogs can suffer from environmental or dietary allergies, which cause constant itching and irritation of the skin. As the itching worsens, the dog will develop bald patches and open sores, hot spots and scabs. They may bite or scratch only certain areas of their bodies and suffer frequent ear infections. Healthy Pets recommends switching allergic pets to a food that contains fewer grains and carbohydrates to reduce inflammation. Your dog may bring allergens into the house after a romp outdoors, so foot soaks and frequent full-body rinses will remove the offending substance from his body and feet. His bedding and living space can be cleaned frequently with nontoxic cleansing products to reduce the allergens in the household. When your dog's hair is falling out or he is scratching incessantly, schedule an appointment with your veterinarian. The veterinarian may order laboratory tests that include smears or bacterial cultures to determine the cause of the hair loss. A biopsy of the hairless area may be performed. Biopsies will confirm hair loss due to parasites or cancer. Blood or urine samples may be taken to rule out hormonal disorders, according to the Merck Manual. Medication, topical shampoos and antibiotics may be prescribed, as well as hormone therapy if needed. Itchy spots can be treated with full-strength apple cider vinegar, which will stop the scratching. If the skin is broken, the vinegar can be diluted half and half with water. Chilled chamomile tea may soothe minor skin irritations and kill yeast and bacteria on the dog's skin. Vitamin E oil, applied topically, can soothe dry skin but may improve skin health overall when given to dogs in pill form. Be sure to ask your veterinarian for advice concerning dosage when giving vitamin E orally. Always ask your vet before trying something new on your dog. PetMD: Hot Spots on Dogs!